Take It Easy, relax and enjoy life! You won't have much work to do in the garden after planting this new rose for which NATURAL DISEASE resistance is a true statement. The dark green, shiny & healthy foliage is the perfect background to showcase the many clustering buds and flowers. 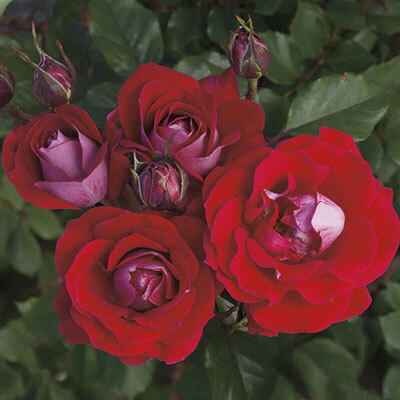 Of a classic red color, this dynamite of a rose has ideal pointy and very elegant buds. The red coloration doesn't go too pink or blue as the petals are falling away. A touch of lighter pink reverse light up the show of this blooming 'machine'. And that's not all. The plant's excellent vigor and the naturally self-maintained habit are other reasons why you can Take It Easy!